Been a bit lazy recently? Feel the spare tyre of Easter egg-dom looming alarmingly close to your midriff as Summer waves a tentative hand? Well perhaps you need to try the FA20 fitness watch then. 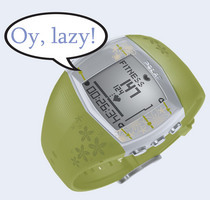 It’s a budget alternative to a personal trainer as it records all activity taken using its internal pedometer. It will also record distance and calories used during your working day and will make graphs of this information so you can track your fitness levels.